What a Spout! Image courtesy of Trent Thompson. 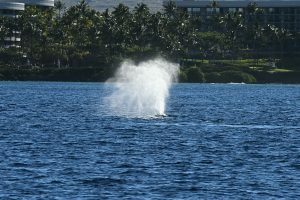 It was another windy morning at Anaeho’omalu Bay during Monday’s Wake up with the Whales Cruise. Guests joining us on this cruise were surprised when a Humpback surfaced about 80 yards from us and spouted right at our 12:00. Captain Will slowed the boat down, and we watched as this whale swam right down our starboard rail, just about 60 yards away. We saw him spout 6 times before he sounded. After that, we kept an eye on the area, and got to see him surface a few more times, though he was always 150-200 yards away. The very last time we got to watch him sound, he was swimming away from us, and we finally got a glimpse of the white pattern on the underside of his flukes. We were in a lee up in Kawaihae, so we didn’t have the wind to contend with during our Mid-Morning Cruise. Most of the Humpback action in that part of the ocean must have been going on underwater, though we did have several sightings of kind of an elusive whale. We got to watch this whale surface, spout, and sound multiple times. He appeared to be by himself, so maybe he was spending his time underwater listening to the other whales in Kohala in order to find a friend. Ocean Sports Whale Fact of the Day: Why don’t diving whales have to clear their ears when they dive like we do when we’re diving (or changing altitude in an airplane)? It turns out that whales have pretty rigid Eustachian tubes (those are the tiny tubes that run between your throat and your middle ear). So, unlike what happens to most of us who have to force air through our collapsible Eustachian tubes to equalize pressure in our ears, the airflow is basically unimpeded for our cetacean friends!